Your compost pile is like a huge concentrated stack of seeds and nutrition. It’s no wonder some plants thrive in that situation. When I threw pumpkin guts on top of my compost pile last fall I wasn’t planning ahead. I also wasn’t expecting anything more than soil improvement. For the last year I’ve rotated my compost pile from garden bed to garden bed, rather than dumping it elsewhere and then carting it to my garden. The idea came about after one of our beds simply refused to grow good crops. Maybe it had too much peat moss in it… maybe the soil was poor… I dunno, but every time we planted crops there, they looked sickly and even our organic fertilizers weren’t making them kick. In the past I’ve considered creating a chicken tractor I could rotate over my beds. Instead I decided to put the chickens in my food forest for now in a simple PVC chicken tractor setup. In the garden I decided to simply dump lots of organic matter right on that lousy bed. I started with spent crops, paper plates, cardboard, old cotton clothing, kitchen scraps and a few buckets of fresh manure. Later we continued to chuck all our kitchen scraps on the bed, including the remains of a couple of tan cheese pumpkins a friend grew. At one point the mound of decaying compost was over two foot tall. It’s a roughly 4′ x 10′ bed so that 2′ represented a lot of organic material. Here in Florida, compost piles end up infested with fire ants and that’s exactly what happened to this one. You basically had to run up to it and throw your compost before the swarming ants tore your feet to shreds. The only way to get rid of these pests is to poison them and I wasn’t about to poison my compost pile. On the up side, I’m sure the turning, chewing, tunneling and excreting done by the ants increased the break down of the pile. I guess you could call that a silver lining, though there’s really not much to like about stinging ants. In the spring of this year I noticed a wide variety of plants popping up here and there on the pile. There were some ugly potato plants, some sprawling tomatoes, a decent amount of weeds (mostly Bidens alba) and some sort of curcurbit vine. When I first saw the vines I assumed they were cantaloupes. After a couple of months they started setting fruit and it rapidly became apparent that they were pumpkins. They didn’t stop inside their bed, however. The ridiculously supercharged pumpkin vines sprawled over hundreds of square feet of space, climbing up into the lower branches of one of my seedling peach trees… running over one of my water chestnut ponds… jumping the path into my sugar cane beds… attempting to smother my son’s yacons and completely covering a couple of adjacent beds and rendering them unplantable. Wherever the vines grew, they added more roots to their stems, but the very healthiest portions of the plants were near the original compost pile. Thus far we’ve gotten over a hundred pounds of delicious pumpkins from that accidental planting. For a few weeks in the heat of August they quit producing fruit… but now they’re back at it again. Yesterday I noted two new baby pumpkins forming and I’m sure there are more I haven’t spotted yet. What Can We Learn From Compost Pile Volunteers? Think about how well some plants do when they pop out of a compost pile. 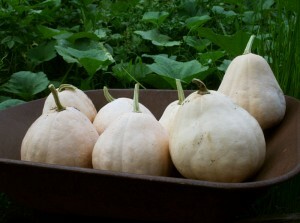 My biggest compost successes seem to be members of the squash family along with tomatoes. No matter how often you turn your compost pile, it always seems like some of the seeds survive the heat and start growing. Incidentally, this is why I don’t buy the “go ahead and indiscriminately throw weed debris in your compost pile – the heat will kill the seeds” line of reasoning. Seeds come through pretty darned well in my experience. In nature, fruits fall to the ground and rot. At some point in the future, provided they aren’t eaten by scavengers, the seeds usually sprout in a big mess. They’re then thinned by cutworms, the weather and competition. Eventually a few of the hundreds or thousands of seeds (fertility of the soil and weather permitting) will manage to grow into adulthood and reproduce. Consider this: what if we deliberately constructed compost piles as garden plots? What if we piled up a mess of hot organic matter in the fall and threw our tomatoes, squash and pumpkins on top? I’ve done something similar with my melon pit experiments; however, those are planted conventionally. The anarchy of gardening on a compost pile appeals to me. What about this: we could put some cardboard over a patch of grass, then pile sticks, wood chips, manure, a few shovels of soil, biochar, feathers, expired vegetables from the Farmer’s Market… whatever we could find… then throw some vegetable seeds or rotten squash on top in the fall? We could even sprinkle the top with some straw for protection. My bet is that you’d get some serious activity in the spring. I’m going to try it this fall – how about you? Are you game for some experimental compost pile gardening? Gardening isn’t all tilling, perfect rows and raised beds. Observe what works on your homestead, then experiment and chase down happy accidents when they occur. Sometimes you’ll end up with 100+ lbs of free pumpkins… and sometimes you’ll gain nothing but experience. And experience is nothing to sneeze at! I agree that squash family veggies are the best in compost piles. This year I have a huge sprawling vine of spaghetti squash growing out of mine – I’ve already picked about 8 nice size squashes. I also had a ton of volunteer cherry tomato plants come up in 2 unused beds from last year, and produced far more than the plants I carefully planted and tended. I’ll be doing more fall planting of veg. seeds this year and letting them go through winter.